So, I was digging the cabinet. Trying to pull the crock pot out of its nest, cursing my lack of space. And these 4 hot pads became dislodged from the back of the cabinet, and fell onto the floor. Nostalgia and memories spilled over me...and I instantly began to smile. These beautiful handmade pot holders came from my Grandma Marshall. She's been gone 6 years this past September. But she will live in my soul until the end of my own life. Let me tell you about Grandma Marshall. I would do ANYTHING to be sitting with her again, quietly enjoying each other's company. She wasn't a woman of many words. She was simple, she was organic. She was beautiful and gentle...I always felt safe and warm at her house. She had lived through many cruel hardships but had remained kind, with the softest of eyes. Her physical strength always fascinated me as a child, when I'd help her collect eggs or feed the chickens or carry water to the coop. Her sheer capability to do just about anything, or make anything, always astounded me. She followed the trends that I am starting to love right now...long, long before they would ever be considered 'trendy': homemade, from scratch, organic, healthy eating with whole foods, homesteading and caring for chickens, gardens, bees, trees. In my earliest childhood she even had a cow and we had fresh milk daily. Her ideals floated above me like a cloud my whole childhood, but I didn't poke my head through until just recently, only within the past few years. My grandma has become my hero, postmortem. She was always a saint in my eyes, but it took some time and years of self-discovery to realize just what a hero she was to me. She and grandpa grew a huge majority of their food, and what she didn't grow, she purchased from the local co-op. They kept bees. They preserved food. They lived quietly, modestly, and provided a healthy lifestyle for themselves, their children and grandchildren. Grandma was known for her handmade gifts. Slippers, wash cloths and pot holders are a few of the practical gifts I remember her giving out. Her handiwork was impeccable. How often did I watch Grandma sitting on the far left end of her 'davenport', working with her hands on all those practical and precious items that would eventually become gifts for her family? Untold hours. When visiting her I'd often sit with her as she worked. As a teen when I would drive by her house at night, after a work shift or marching band practice, I'd catch a quick glimpse through her sheer curtained-window before I reached my own driveway just down the road; more often than not I'd see the form of her sitting there, working. She poured love into her hand-fashioned gifts, and I could always feel it. I felt it as I picked up these pot holders after they tumbled onto my kitchen floor, after years of being stuffed in the back of a cabinet. The family had found them in a pile of things left in grandma's house after her death--gifts that were intended to be given at some future date, but that had sat, un-given, among all of grandma's other things. The months it took to go through her house are a blur to me. I wanted little to do with it, because I was selfish and it hurt too much. My mom gave these pot holders to me after they were found in grandma's house, and my mind wasn't ready to deal with them, so I remember shoving them far back, away from me, deep into the cabinets. There they became forgotten...until just the right time. That I found them at Christmas time seems too good to be true. I will admit that an old version of me would have seen these brightly colored hot pads as a bit tacky, impossible to 'decorate' with or to fit in. But as the years have passed, I've realized I'm not much a of decorator anyway, and quaint colorful items like these are enticing and gorgeous to me. If Grandma were alive right now and still creating these homemade beauties, she may even be considered trendy! 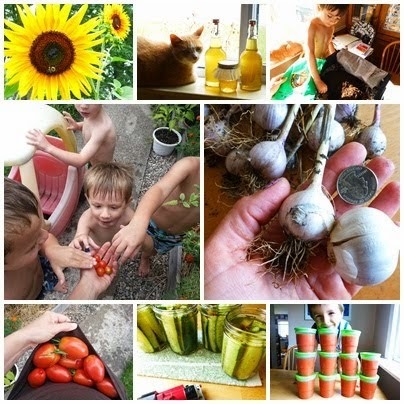 Homemade and quaint and practical is the thing to do in the homesteading/gardening circles. Will I dirty these up with my baking and cooking projects? Grandma would want me to, I know. I just am not sure if I can, yet. But I am going to make sure these hot pads are in plain view, displayed even, and not shoved into a cabinet. They are truly the best Christmas gift I will get this year. Thank you, Grandma, and I love you always.